A hurried father running here and there to ensure all guests are satisfied and all their needs are fulfilled, Friends and Family members of Bridegroom are busy analyzing the bride and their family and vice versa. Kids are busy playing with new friends and enjoying the food. Cook hired by the Bride’s father is ensuring enough and tasty food is served as needed by the guests, Young boys of the bride’s society are busy serving the guests while young girls are ensuring that bride is looking like an angel every moment. Priest’s focus is to ensure all celestial bodies of this universe are informed about the great spiritual bonding that is going to happen, the aggressive fire is playing the role of the messenger passing the priests message to the celestial bodies, bride is shy, fearful yet excited about her divine journey to the new family with the bridegroom sitting next to her whom she hardly knows, bridegroom is happy and proud to take the most talented daughter of one respectable family and give her the charge to take care of his family. Everything here is arranged. Two families accepted each other, bride and bridegrooms compatibility is calculated by more than 5000 year old proven mathematical calculation and the marriage is the occasion to ensure both the societies and all celestial bodies are aware of this heavenly bonding called marriage. 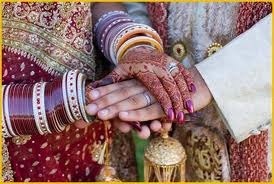 Indian traditional marriage is always arranged. Everything is arranged. The moment when bride will first time look at the bridegroom, the time when womb software(mantras to activate womb) will be installed, the moment when the father will handover the responsibility of his daughter to the bright young man and at what time bridegroom will leave the bride’s home with his newly wedded bride is arranged. All these moments are decided by doing a thorough mathematic al calculation of the positioning of various stars, moon and planets. A suitable boy for the daughter is decided by the parents because wisdom comes from age and big decisions should be taken by wisdom not emotions. Emotions sometimes tend to let people take the decision which may look right at that moment but may fail when realities of life starts biting. Behavior of a person can most of the times be judged by the family he belongs to and even if he behaves differently then as per traditional Indian family system other members of the family can take care of him and correct the boy. But if you try to judge the person by his or her own behavior then 100 years of dating may not be enough. In both the scenarios you are taking risk but which risk is less hazardous is the one to be considered. Thank you for the write up to go with your photo – an arranged marriage is one of the thoughts that came to me when I saw the topic for the Weekly Challenge but this is not part of my culture. Now I know so much more. Arranged marriage is so common in India that it came to my mind as soon as I saw this challenge. Thank you for stopping by. Thank you 🙂 I am glad you liked it.